The elements in group eighteen are Helium, Neon, Argon, Krypton, Xenon, and Radon. These elements are all in all alluded to as noble gasses. The expression "noble gases" infers that these elements have a tendency to be chemically inert or un-reactive. Fluorides of Krypton and compounds of xenon, such as Oxides, fluorides, and oxyfluorides, are well known. The manufacturing of these compounds can only be performed under extreme conditions of high temperature and pressure. The general valence shell electronic configuration of elements of group 18 is ns2 np6, with the exception of helium which has the electronic configuration of 1s2. Due to the duplet or octet configuration in their valence shells, the group eighteen elements are quite inert. Due to the closed shell structures, these elements have less or no inclination to frame compounds. The valency of these elements is zero since these elements do not tend to lose, pick up or impart electron to particles of different elements. Attributable to their stable and inert nature, all the noble gasses occur in the atmosphere in the free state. All the noble gasses, helium, neon, argon, krypton and xenon, apart from radon, exist in the environment. Approximately 1% by volume of the atmosphere is made up of these gasses, of which argon alone constitutes 0.93%. Argon can be prepared by fractional distillation of liquid air. The most essential economic and commercial source of helium is the natural gas deposits. Certain water springs contain neon, helium, and argon as disintegrated gasses. Radon, a radioactive element is obtained by the decay of radium and thorium minerals. The nuclear radii increment on moving down the group with increasing nuclear number. This is a result of the expansion of another shell at each progressive element on moving down the group. 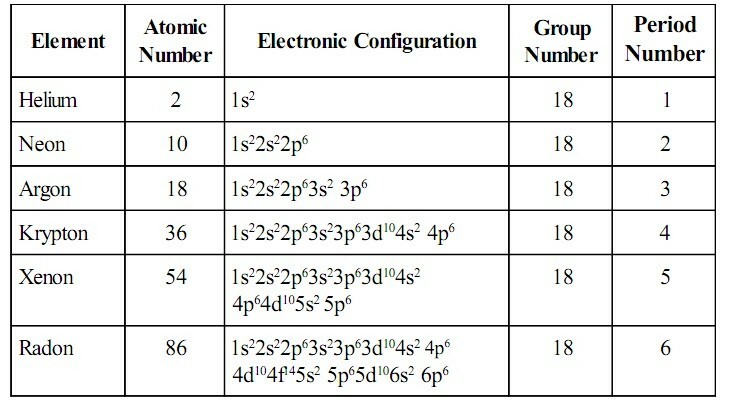 Group 18 elements have stable electronic configurations. They have zero tendencies to accept any electron. Consequently, they have high positive values of electron gain enthalpy. Due to their closed electronic configurations they have high ionization potentials. Ionization enthalpies decrease step by step on moving down the group with an expansion in the nuclear size. Due to the closed electronic configurations of elements of group eighteen they are unable to frame compounds under ordinary conditions. Because of their stable nature, these elements exist in a free state as monatomic gases. These elements are tasteless, odourless and colourless gases. They are sparingly dissolvable in water. The particles are held by the weak Vander Waals forces. These forces are likewise known as London Dispersion Forces. The extent of Vander Waals forces increments on moving down the group with an expansion in the polarizability of the molecules. These elements have low melting and boiling points. This is, because of the presence of weak Vander Waals forces responsible for attraction. The melting and boiling points increments on moving down the group with an expansion in the extent of the Vander Waals forces of attraction. 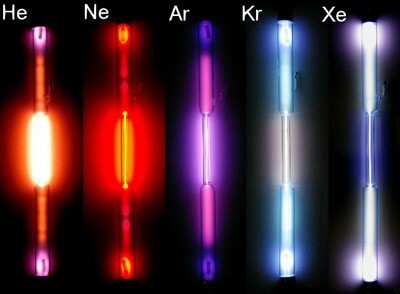 These noble gases can be condensed at very low temperatures due to the weak Vander Waal forces of attraction. With an expansion in the size of the Vander Waals forces down the group, the ease of liquefaction of noble gases likewise increases. Helium has the least boiling point among every one of the elements in group eighteen. These elements are chemically latent because of their stable electronic configuration. 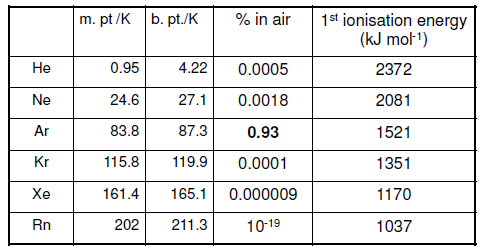 Group 18 elements have high positive electron gain enthalpy and high ionization enthalpy. Later, many compounds of xenon were integrated, including fluorides, oxyfluorides, and oxides. The chemical movement of group eighteen elements increments with a diminishment in the ionization enthalpy on moving down the group. The ionization enthalpies of helium, argon, and neon are too high for them to shape compounds. Krypton only forms krypton difluoride, since its ionization enthalpy is marginally higher than that of xenon. 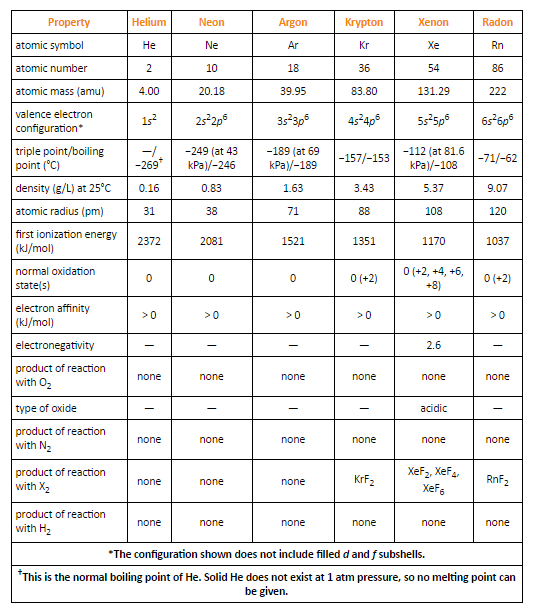 Although radon has less ionization enthalpy than xenon, it shapes just a few compounds like radon difluoride, and a few complexes, since radon has no steady isotopes. In any case, xenon shapes an especially more prominent number of compounds. Helium is flammable, and has a low density. That is the reason it is utilized to fill aircrafts and weather balloons. You realize that helium has the most reduced boiling point among every one of the elements in group eighteen. It has the most minimal boiling point of any element, only 4.2 K. Consequently, fluid helium is utilized as a cryogenic agent to perform tests at low temperatures. Liquid helium discovers use in cryoscopy to get the low temperatures needed for superconductivity. Fluid helium is utilized to cool the superconducting magnets utilized as a part of atomic magnetic resonance spectrometers. It is utilized as the cooling gas in gas-cooled atomic reactors, and as a stream gas in gas-fluid chromatography. Helium is utilized to weaken dioxygen in the oxygen cylinders carried by the sea divers while diving. Neon is utilized as a part of minute amounts in release tubes and fluorescent light bulbs that give the well known red orange shine of "Neon" signs. Argon is generally used to give a stable atmosphere in research centre mechanical assembly, and for metallurgical procedures, for example, in welding stainless steel, magnesium and aluminium. Krypton is utilized as a part of fibre lights and release tubes, while xenon is utilized as a part of release tubes to deliver the rapid flash required for photography. Radon discovers use in radiotherapy in the treatment of cancer.